If you follow the cowboy action shooting crowd - most put a leather wrap on the lever. This softens and tightens down the finger grip area of loops to allow them to shoot faster. The large loops look ridiculous to me. Functionality is questionable. ... You have to remove the lever to take the bolt out for cleaning, I don't think it would be a big deal to change it to the small loop?? +1. Marlins are easy but the lever has to be fitted on a Winchester. Easier to just buy it that way. 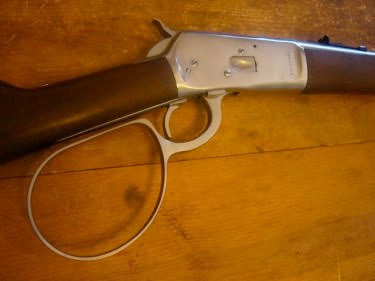 Best of all, this will allow you to keep a lever gun at ringside. Never know when Comancheros will come busting in and not have time to pull off your boxing gloves. Nothing wrong with having a ‘92 carbine set up like John Wayne’s. OP just wants to have fun with a carbine and I don’t blame him. I’m the same way. I still have my AR’s, AK’s, and Riot Guns for home defense but sometimes it’s fun to shoot Lever Action Rifles and Single Action Revolvers. Adding goofus fad stuff makes it more fun??? Chuck Connors was only 18 when John Wayne was carrying the 92 in Stagecoach. That would have been in 1939 for those who don't know. Yes, yes it does. You should try having fun you might like it. I wish more people knew how much fun it is to go shooting. I started my girls shooting when they were young and they still enjoy shooting, even though they’re in their 30’s. I hope to take my grandsons to the Range pretty soon (they live out of state). If you don’t enjoy shooting you’re doing something wrong. I felt the same way when I was teaching my girls. At work (LE), part of my job was being a Firearms Instructor. That was work. Teaching my girls was a pleasure. I personally really like the medium loop levers from Ranger Point Precision. One of my favorite old shows was (1958) Wanted Dead are Alive, McQueen used a mares leg 92 with the big loop, Chuck Conner did modified his loop with a trip screw for the first assault 92. The giant loops are stupid. The slightly enlarged ones, sized for an adult hand to fit, or for use with gloves, make a lot of sense. Their was a guy on the Marlin forums that reworked custom ones. I had him do about 7 or 8 for me. Big improvement over the tiny Marlin lever stock size. I carry him thru the house telling him about all the trouble we are going to get into. I have the Rossi .357 mag. The large lever is purely for show. I can swing it and load it , it's no big deal, but it is a pain to cycle normally. The rifleman rapid method employed a screw pointing at the trigger in the ring so as the lever is closed the screw hits the trigger and it fires , holding the gun against his hip and moving is other hand forward and back in the ring, not dropping and raising as you do normally. There is an intermediate ring size (OVAL) that is more practical for gloves and mittens , that one might be more practical in the long run IF you plan on using the gun in the winter time, justifying the need to be wearing heavy gloves . Go for it! I’ve got a Winchester/Miroku 1892 w/ Large Loop Lever along with a couple clones. I never warmed up to the idea of putting a large loop lever on one of my Marlins though. The large loop lever is pure Hollywood, developed by Yakina Canutt for John Waynes’s carbine in “Stagecoach”. It’s not necessary or authentic but I sure like the looks of it. The bolded is exactly where I am. They look cool, but are pretty much useless. Heck, for running one hard, I'm almost like a smaller loop. Something fitted to the hand. Lot's of slop in a Winchester '94 already, don't need to add to it.